HAMSTER's strange and random time-hopping will return in the coming week when The King of Fighters '95 joins the Switch eShop line-up on 12th October. The second game in the series brings a rather welcome option that would go to become a series staple: You are not confined to pre-determined teams, so you can pick any characters from the roster to make your own dream trio. The Sports Team from the previous game didn't make the play-offs and has been replaced with the "Rival Team" made up of series favourite Iori Iagami, along with Billy Kane and Eiji from Fatal Fury and Art of Fighting fame respectively. Another solid (if already outclassed) entry in the series awaits next week. Are there any good arcade memories of this one among you NL readers? Will you pick up this entry to add to your growing list of Neo Geo titles? No. I already have the fighting games I want on Switch. I admit to having poured a loooooooooot of coins on this one since it was available at both local arcades and coffe shops in Algarve. It was probably the game that turned me into a fan of the series, incredible tight balance and responsive controls. whens the next nintendo arcade game coming? Nice! Rather them release it than not, but I really want the Nintendo games now, and hopefully Haunted Castle... as I’m watching Bram Stoker’s Dracula. Its Rocktober time! I'll be skipping this, 98 is enough for me. I'm waiting for Last Blade 1 or 2 and Samurai Shodown 2 and that'll be enough fighters for me. Robo Army is next up on the 19th and then it's Mutation Nation on the 26th. Both certain purchases. Hamster should then announce the next batch which will hopefully include some sports titles. Pulstar and/or King of the Monsters would be great too. Meh. I know fighting games are the Neo Geo's greatest strengths, but it feels like a bit of a waste, at least for me. I can't wait for more shmups (Pulstar or Prehistoric Isle 2) or more beat 'em ups (Sengoku 3 or Mutation Nation). The king of high damage output/low health, but now we get to edit teams! Skipping this, for now. @Dava1234 They plan on releasing every single Neo Geo game possible. There's that many KoF games they're going to keep appearing every few releases. Love Hamster's productivity, but I'm turning blue here from holding my breath for Baseball Stars Professional (and Punch-Out!!). So enough with the fighters already. 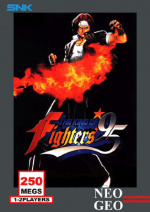 I prefer just kof 98 and above. They are the better games. They should work on 2002, since it is on the Xbox 360 and xbox one. Great game just hope it's a good conversation. One of my favorite old King of Fighters game and also the first one to introduced Iori Yagami, the yang to KOF's yin, Kyo Kusanagi. @OorWullie how did Zed Blade end up treating you? 95 ain't bad, but the series gets better with 96. Now it's just Samsho II that's left for me to be satisfied. @NinChocolate I had some fun with it. I just went straight into high score mode and managed to get into the top 10.I've not played it in a while but I'll definitely go back to it once I get an arcade stick. I've held off on buying the Hori one until I see how the 8bitdo one reviews. It's out at the end of this month and cost half the price. I’m frustrated that other consoles got Samurai Shodown 2 recently, where’s that? Apart from on my Wii I guess if I booted it up. @OorWullie ya it plays nicely with the arcade stick as expected. I got the 8bitdo stick for Switch and I can recommend it if you’re not used to the brand name hardware. I did a mod job on the lever spring to get it feeling right and will probably replace the buttons with some arcade brand stuff eventually, but that’s still cheaper than the Hori stick and I like the look of it much better. The wireless also sold me on it. Had to be released some time. @Lroy Nightmare in the Dark would be great. I only learned of that game a couple of weeks ago. It's never seen a home console release. Really looking forward to Mutation Nation, just the name alone makes me want to play it. @NinChocolate I didn't know there was already an 8bitdo stick available. I've been checking Amazon and it said it releases at the end of the month. Is it the NES style one you have? this is getting ridiculous and borderline trollish. Another stellar week. Keep em coming! I haven't missed a single Neo Geo game on Switch. This is quickly becoming one of my favourite systems ever. Now if only we'd get Neo Geo Pocket games as well when the Virtual Console hits. Getting this....waiting on samsho II. I already have KoF 94-98 on the Orochi Collection for Wii, but of course i understand these are good games worth releasing. Anyway, i hope we get Ironclad, Twinkle Star Sprites, Aero Fighters 1&3, Prehistoric Isle 2 and Sengoku 3 soon.